Here you may find a few of the Buddha’s discourses as translated by Bhante Suddhāso. These discourses have been selected primarily for their practical value in following the Buddha’s path. This is a very subtle and profound discourse, that is not recommended for those who are relatively new to Sutta study. It approaches conscious experience as being the result of perceptual distortions in the minds of unenlightened beings, and how experience is radically different for awakened beings. A discourse about living in accordance with the Buddha’s teachings, so that we may inherit his priceless legacy – the path to Awakening. A discourse where the Buddha talks about his experiences with overcoming fear during the time he was practicing meditation before attaining Awakening. In this discourse the Buddha describes many different flaws that may be present in our habitual ways of thinking and acting; and, accordingly, how we can remove them in order to become flawless. A discourse about how to attain anything from respect, wealth, and fame to psychic powers, mental purity, and complete enlightenment. Beginning with a simile about the necessity of cleaning cloth before dyeing it, the Buddha lists fifteen mental impurities and speaks about the necessity of removing them from the mind prior to developing wholesome mindstates. The Buddha explains what humility is, gives numerous examples of how to live a life shaped by a commitment to humility, and its relevance to the path of Awakening. This discourse begins with a question common among Buddhists: What is right perspective (sammādiṭṭhi)? Several different ways of understanding right perspective are provided, culminating with a description of dependent origination (paṭicca-samuppāda). Widely considered to be one of the most important discourses in the entire Canon, this discourse provides a wide range of meditation techniques for developing both concentration and insight, as well as an overview of many of the central doctrinal components of Buddhism. In this discourse the Buddha explains some of the differences between his own system of spiritual self-development and the spiritual systems taught by teachers outside the Buddha’s dispensation. Here the Buddha extensively describes the various special qualities of a Sammāsambuddha (a completely self-enlightened being), and speaks in detail about the practices he did prior to discovering the Buddhist path. The Buddha explains many of the drawbacks of sensuality. Another sutta on the drawbacks of sensuality, concluding with a refutation of some of the central points of Nigaṇṭha (Jain) philosophy. An explanation of how to make oneself easy to teach, so that one’s spiritual companions can help one make progress on the path. A straightforward guide for deciding whether to continue living where one is or move to another place. Here we find a very deep and intellectually satisfying discourse about the nature of mental proliferation (papañca), delivered by Venerable Mahā-Kaccāna – one the Buddha’s foremost disciples in giving thorough explanations. Here the Buddha describes a practice he did prior to attaining enlightenment: dividing all his thoughts into two separate categories and evaluating the results that each category of thought had on his mind – a practice that is similarly of benefit to any unenlightened being who wishes to purify their mind. He then moves on to explain what he did subsequently to bring his practice to fulfillment. In this amusing discourse, an argumentative philosopher named Saccaka comes to the Buddha and attempts to defeat the Buddha in debate – an attempt that fails spectacularly. Subsequently, the Buddha gives an extended explanation of anattā (the impersonal nature of all phenomena) that Saccaka finds quite convincing. A discourse centered around a brief and profound Dhamma teaching the Buddha gave to a celestial being (deva) – and Venerable Mahā-Moggallāna’s subsequent endeavor to encourage that being to pay more attention to what the Buddha said. A long discourse on the nature of rebirth, consciousness, and direct personal knowledge, culminating with an extended description of the virtuous conduct of a renunciate practitioner. A detailed explanation of the path of a contemplative who seeks full enlightenment, from the initial stages all the way to completion. One of the discourses delivered by Venerable Sāriputta, the Buddha’s wisest disciple. The format is one of a series of questions asked by another monk, Ven. Mahākoṭṭhita, covering a wide range of subjects, from the nature of consciousness to different varieties of concentration. A discourses delivered by Venerable Dhammadinnā Bhikkhunī, a nun identified by the Buddha as the foremost Dhamma teacher among Buddhist nuns. In it, Venerable Dhammadinnā answers a variety of questions ranging from overcoming self-obsession to the nature of the three kinds of feelings (pleasant, unpleasant, and neutral). A famous incident during the Buddha’s time was “The Quarrel at Kosambi,” an ongoing dispute between two groups of monks. In this discourse, the Buddha explains to those monks six kinds of conduct that lead to communal harmony. He then moves on to explain seven characteristics of a stream-enterer – one who has attained the first irreversible stage of enlightenment. A brief discourse delivered by Venerable Ānanda, the Buddha’s attendant, laying out eleven methods of attaining enlightenment by developing concentration and the recognition of impermanence. Venerable Mahā-Kaccāna uses a series of real-life examples to teach a king that all people are inherently equal, regardless of birth or social class. Venerable Ānanda gives King Pasenadi a clear, direct explanation of what actions are blameworthy and what actions are blameless. This discourse is a series of questions posed to the Buddha about the five aggregates (body, feeling, recognition, thought, and consciousness), culminating in an explanation of not-self. For those who are interested in jhāna (deep concentration), in this discourse the Buddha describes the mental constituents of each stage of jhāna in more detail than can be found anywhere else in the Suttas. In this discourse, the Buddha describes what actions lead to positive results – longevity, health, beauty, wealth, influence, etc. – and what actions lead to the opposite results. The Buddha describes the path of non-conflict in several different ways, focusing particularly on how we can speak and communicate with others in ways that minimize unnecessary conflict. The Buddha delivers an extremely profound discourse to a contemplative named Venerable Pukkusāti, about how to contemplate the six elements (earth, water, fire, air, space, and consciousness) in a way that leads directly to enlightenment. One of Venerable Sāriputta’s discourses, this was given to the famous lay disciple Anāthapiṇḍika on his deathbed. In it, Venerable Sāriputta gives a long list of various things that are not to be clung to. A discourse on how we can relate to the six senses (sight, sound, smell, taste, touch, and thought) in a way that leads to freedom from suffering. 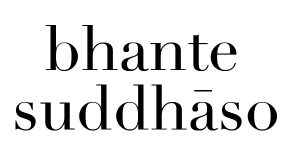 Very rarely in the Pāli canon did the Buddha directly speak about duality. This discourse is one such place, where the Buddha speaks about transcending the duality of existence and non-existence. A profound discourse about the emptiness of all phenomena, centering around five hard-hitting similes demonstrating the insubstantiality of the five components of body-mind. A short sutta about eleven ways to properly view every component of one’s body and mind if one wishes to attain any stage of enlightenment. A brief discourse giving an overview of the Buddha’s 16-step meditation instructions for practicing mindfulness of breathing, from the initial stages of concentration up to the development of liberating insight. A very brief discourse about the invariability of the Three Universal Characteristics. A short discourse outlining four ways to develop equanimity. A list of five contemplations that all sincere Buddhists should bring to mind every day, regardless of whether or not they are monastics. A short discourse in which the Buddha delivers a very concise explanation of a direct path to sudden awakening, attained by recognizing the impersonal nature of sensory experiences. In this discourse, the Buddha utterly refutes racism, sexism, classism, and other such forms of prejudice; he clearly establishes that the worth of a person is entirely dependent on the choices they make during their lives.